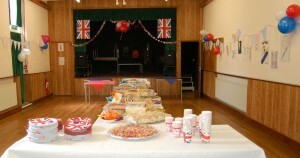 The 2nd of June brought the village together in celebration of the Queen’s Diamond Jubilee. 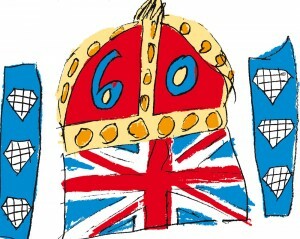 60 years on the throne and still going strong, the Queen gave us a good excuse to have a party and have some feel-good fun amidst the doom and gloom of economic catastrophe, global warming and all things war-related. All over the country people were preparing for an estimated 10,000 street parties and the parish of Otterhampton was no exception. Emails were exchanged, phone calls made, meetings were had, spreadsheets produced and meticulous plans had been in the making since February and a team of dedicated residents gave up hours of their time to organise what turned out to be a fantastic day. Even the rain stayed off right to the point where we were packing everything away. Saturday began early for those involved in bringing it together and all the helpers were down at the village hall or on the green hours before kick-off, eager to get this party started. We’d split into two teams – Food & Beverage and Entertainment and everyone knew what needed to be done so there were no panics or dramas on the day. The F&B girls spent the morning carefully preparing a fantastic spread of food which was beautifully displayed in the main hall and the pork joints were put in to roast in the kitchen at The Anchor. The Entertainment team busied themselves, with great amusement, pinning up the bunting, blowing up balloons, pumping up the space hoppers (and trying them out just to make sure they were safe! ), putting up signs, getting the PA system ready, erecting gazebos and setting out the games and activity areas. 12 noon saw the start of the judging of the best dressed house competition and dozens of houses did the village proud, adorning their property with bunting and balloons as well as some spectacular embellishments involving the royal family. Just brilliant. By 1.30pm we were almost ready and enjoyed a quiet half hour before the residents of Combwich, Otterhampton and Steart descended on the green. Last minute check of all areas, quick change into our red, white and blues and suddenly the party began with the chauffeur-driven arrival of our very own Queen and Prince Phillip. 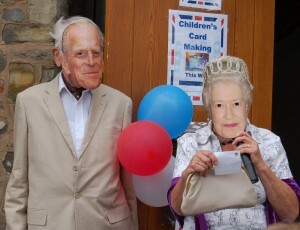 After being presented with a village-made posy by two village children, our Royals declared the party open. There was something for everyone and children’s races were opened up to the adults, to the great delight of the spectators! Egg and spoon, dressing up race, space hopper race and the children’s scooter heats needed no coaxing to take part. Children’s card making for the younger ones was happening in the hall and face painting, big bubble making, chalk painting, hula hoops and apple bobbing saw a return of some good old traditional English party activities with prizes for all, including one for the best-made crown. The highlight game was probably the tug o’ war – the rope, incidentally, was a real tug o’ war rope as used in the National Championships and borrowed from the Chairman of the Tug Of War Association, no less! What started out as a series of serious mens and ladies tugs, soon turned into a free-for-all which even involved the community police officer! What fun. Tables were laid whilst the games were going on and soon it was time for the tea party – a huge array of delicious food and even some crayons for the kids to draw on the table cloths, finished off with the distribution of 100 Combwich Jubilee commemorative medals for all the children and volunteers. But the day didn’t end there! 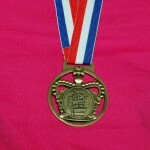 Next up was our very own Jubilee sail-by organised by the Combwich Motor Boat and Sailing Club. Sail boats and motor boats all trimmed up with their flags and bunting sailed up and down the Parrett in celebration of the Queen’s 60 year reign. The boys done good! 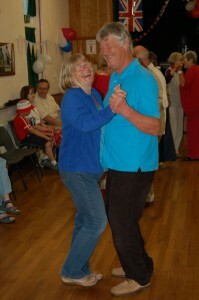 Whilst everyone was enjoying their Jubilee tea and the regatta, volunteers were preparing the village hall for a tea dance and what a full house that turned out to be! Foxtrots, Waltz’s and Gay Gordons were the order of the day, washed down with a cuppa and some home-made cake and finished off with a rousing rendition from the village choir sporting their union jack scarves and hats and who expertly got the whole of the hall involved in a sing-along. Another round of packing things away and then it was on to the Right Royal Quiz at The Anchor – another very full house and some puzzling questions from our quiz-master and which, due to the place heaving at the seams, had to be relayed (with great amusement) all the way to the other end of the pub. 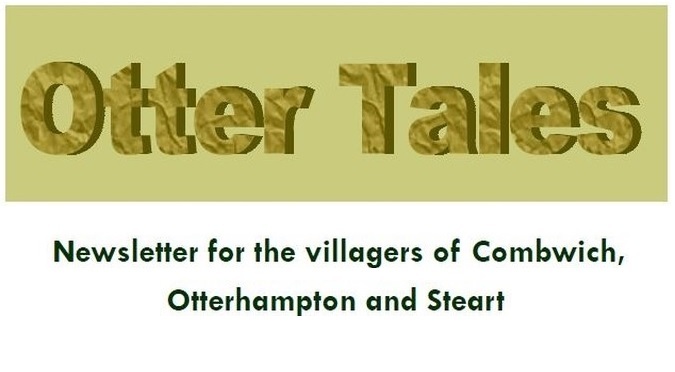 Once the quiz was over, it was time for the Open Mic Music Fest where some amazing local talent played, strummed, sang and serenaded the village until midnight and the party finally came to a close. We’d all agreed at planning stage that we wanted to make our street party a day to remember and we hope we did just that. If you have any favourite parts of the day or highlights of the celebrations or you have any photos you’d like to share, please get in touch – admin@combwich.org.uk – we’d love to hear from you. To see more photos of the village Jubilee please click here.